As Kevin Durant walked by, a female Oklahoma City Thunder fan unrolled toilet paper close enough for Durant to see his face on each square. Bitter Thunder fans were still chanting, “cupcake … cupcake,” at the Golden State Warriors newcomer. Despite the bizarre and unforgettable Saturday night, a victorious Durant got the last laugh in his return to Oklahoma City and ironically slapped the hand of a man wearing a Seattle SuperSonics T-shirt as he headed to the visitors locker room. 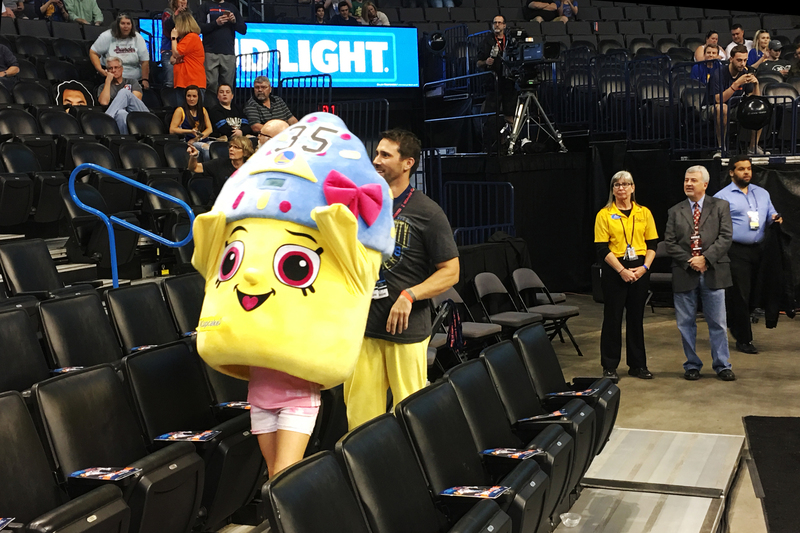 Yes, Thunder fans, your voices were heard, from the hanging toilet paper to a giant walking cupcake to the heckling fan behind the Warriors’ bench. Regardless of what Thunder star Russell Westbrook thinks about his old teammate, it’s time to move on and let this whole Durant disdain go. There is nothing good that can come from it. The news that Durant was heading to a Western Conference rival that the Thunder blew a 3-1 series lead to just a mere step below the 2016 NBA Finals was stunning and painful. And his lack of communication with Westbrook about his departure has led to conversations of only a trash-talking variety during three games this season. Durant had already played the Thunder twice this season, but both of those blowouts occurred in his now comfortable confines of Oracle Arena in Oakland, California. But there was no bigger ticket in the state this year than Durant’s nationally televised boo-a-thon return to Oklahoma City on Feb. 11. The Thunder fans came creative and ready to have their jeers heard and signs read, too. Former Thunder center Kendrick Perkins used to call his teammates “cupcakes” for being soft, and Westbrook posted a picture of a bunch of cupcakes the day Durant announced his departure. As soon as Durant walked onto the floor for pregame shooting, Thunder fans chanted “cupcake,” but he silenced them with music in his headphones. One fan creatively dressed as a mammoth yellow cupcake with Durant’s name and No. 35 stitched on it. A fan welcomes Kevin Durant of the Golden State Warriors back before a NBA game against the Oklahoma City Thunder at the Chesapeake Energy Arena on Feb. 11 in Oklahoma City. There was some other fan cleverness as one Thunder fan wore a T-shirt that read, “35-35=0,” in reference to Durant’s and Westbrook’s jersey numbers, respectively. There were also some harsher ones, such as a poster that said “I trust Russia more than I trust K.D,” and another displaying a picture of teammate Draymond Green holding the belly of his infant son’s mother when she was pregnant with Durant’s face superimposed on her body. Taylor says he taunted Durant without cussing or crossing the line and he teased Green about his reputation for kicking during some games. He maintained that he never said anything racist or vulgar during the game and that security would have ejected him if he did. Durant’s damaged relationship with Westbrook simply adds fuel to the fan furor. Divorce is never easy. The two reportedly have not had a friendly conversation since Durant’s announcement. And there certainly was no love lost that night as they both tossed fiery words at each other during one timeout that thankfully never turned into a fight. 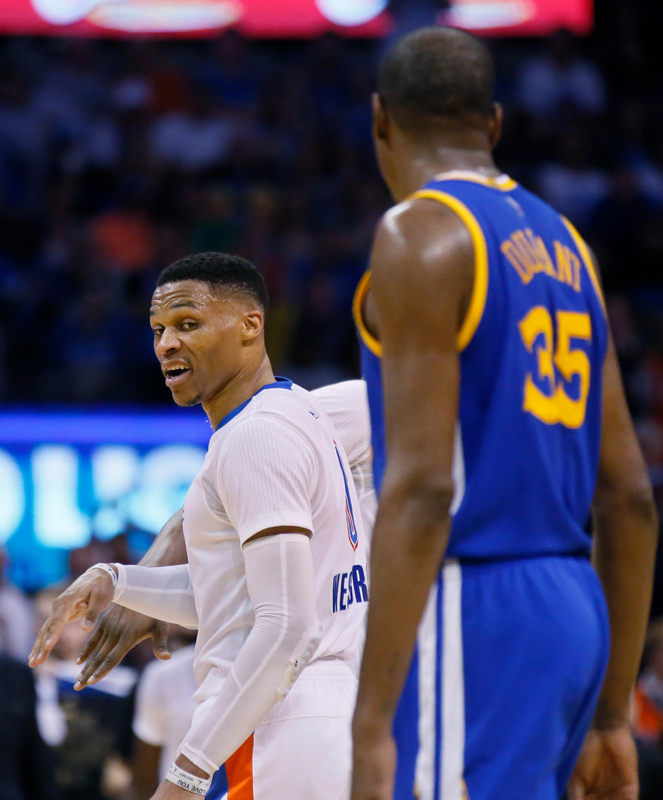 Oklahoma City Thunder guard Russell Westbrook (left) comments to Golden State Warriors forward Kevin Durant (No. 35) as they walk off court for a timeout in the third quarter of an NBA basketball game in Oklahoma City on Feb. 11. After the game, they both ate at separate tables at a popular local steakhouse. Awkward. But it will be even more awkward during NBA All-Star Weekend in New Orleans as the two MVP candidates will be teammates again. Don’t expect these fences to be mended anytime soon. Word is the blood is very bad. “It’s over with. He plays for his team, I play for my team. Let him do his thing, I do my thing and that’s it. Plain and simple,” Westbrook said. Thunder fans will understandably follow their loyal leader, who may stay in Oklahoma City his entire career. And if Westbrook let it all go by offering Durant some well-wishes on his decision and career, many Thunder fans probably would have calmed down after Feb. 11. But that ain’t gonna happen. The NBA has had some unforgettable star return contests in recent years. Shaquille O’Neal’s return to Los Angeles had Lakers fan split between their former center and Kobe Bryant. Perhaps the most hateful in NBA history was LeBron James’ first return to Cleveland as a member of the Miami Heat. Then there was one of the kinder, gentler variety this season as first-year Chicago Bulls guard Dwyane Wade returned to Miami as a visitor after 13 years of service and three championships with the Heat. Warriors coach Kerr was a color analyst for Turner Sports during James’ first return to Cleveland. He believed Durant’s return was nearly as venomous. “A little weird position to be in,” said Kerr. “I don’t think any of us could ever imagine what he was thinking out there and the emotions he was going through in his body and his mind. It was kind of a strange event. “You got people you know love you deep down, but they’re screaming, yelling and calling you names. It’s kind of a weird, weird feeling. But he handled it beautifully and played a great game,” Kerr said. Kerr said he understands the emotions of the fans when a star player leaves during free agency, because they fall in love with the players. But Green added that fans hypocritically don’t respect the players’ ability to make a choice in free agency. “I don’t think the fans lose sight. I don’t think they have sight,” Green said. “But I appreciate [NBA pioneers] for giving us the right to have that freedom. If somebody leaves Google to go to Apple or Amazon or whoever or Spotify, no one is killing them for making a better decision for their livelihood. This is what he thought was a better decision for his livelihood. The anger in Durant’s first return to Oklahoma City seemed the most over the top considering what he did for the franchise and the community. He — not Westbrook or James Harden or Serge Ibaka — made “Thunder” a worldwide basketball name. Durant was drafted by Seattle with the second overall pick in the 2007 NBA draft and played his rookie season in the Northwest. After 41 years in Seattle, the Sonics franchise moved to Oklahoma City and changed their nickname to the Thunder in the offseason of 2008. Oklahoma City’s only history with the NBA was when it temporarily hosted the New Orleans Hornets after Hurricane Katrina. Oklahoma City was blessed that the Thunder arrived with a budding star in Durant. His success in a Thunder uniform changed the city from a place viewed as a country town to a basketball powerhouse. He made seven NBA All-Star appearances as a member of the team, led the team to its lone NBA Finals appearance in 2012 and two Western Conference Finals. And who can forget his live press conference when he called his mom, Wanda Pratt, “the real MVP,” when he was awarded the Thunder’s only NBA MVP award in 2014? Oklahoma City and Thunder fans were proud and sticking out their chests. When the Sonics arrived in Oklahoma City, they were worth $300 million, now they’re worth nearly $1 billion, according to Forbes. Durant made a difference off the court too. In 2013, he gave $1 million in the relief effort to Moore, Oklahoma, after a tornado killed 24 and injured 377. He was named to the 2015 Oklahoma Sports Hall of Fame, and even after his departure to the Warriors, he gave $57,000 to a new school for the city’s homeless called Positive Tomorrow last December. Long after the buzzer that Saturday night, numerous elderly employees at Chesapeake Arena made a point to visit with Durant as he was departing. The men and women hugged him tight. Durant genuinely asked how they were doing, reminisced and was in no rush. They didn’t care that he was not playing for the Thunder anymore. KD was a friend whom they saw grow to a man in Oklahoma City. They missed him. “That is the real-life part of it,” Durant said. Thunder fans should never stop booing any star from another team scoring at will against their own beloved squad. Durant expects the same to be the case when he returns with the Warriors in March. Booing an opposing team’s superstar is often a sign of respect. But Thunder fans need to let the anger go. Durant is as notable to Oklahoma sports history as Mickey Mantle and Jim Thorpe are. The Thunder will want him to participate in their 10-year anniversary of making it to the NBA Finals in 2022. At some point the team will want to retire Durant’s No. 35 jersey. And Thunder fans would certainly love for him to say nice things about the franchise and his time in Oklahoma City when he becomes a Naismith Memorial Basketball Hall of Famer. Who knows? He might want to end his career there if on good terms. Word is Durant was really hurt on Saturday for being treated so poorly after all he had done for the Thunder, their fans and Oklahoma. Long after the dust settles, there will be a day when most Thunder fans will miss Durant and appreciate all that he did. But considering the emotion of his still fresh divorce, can the Thunder fans even think that far ahead? “That’s a tough question,” Taylor said.